JB Good Roofing Ltd - A fully qualified and highly skilled roofing company based in Croydon. We are a friendly and reliable team who work hard to maintain our reputation as one of Croydon's most trustworthy roofing companies. We pride ourselves on offering a hassle free and affordable service where the customers needs always take priority, as do excellent quality workmanship and operating to modern standards. As a company we are confident that we can meet all your requirements on your next roofing project and also exceed your expectations when it comes to quality and affordable roofing services in Croydon. All of our team members are highly skilled in the roofing trade and have built up a wealth of experience over the years, so no job is too demanding for us, as we have all been trained to deal with every situation that the roofing trade can offer. We have been providing Croydon’s residents and businesses with a wide range of customer focused roofing services for many years! JB Good Roofing Ltd have many satisfied and returning customers because we provide the best and most comprehensive roofing services in and around Croydon. With a friendly service from start to completion, and an experienced and qualified team, you can rest assured that you are getting both excellent value for money and a polite and professional service at each and every job we attend. If you are in need of a qualified, reliable roofer in and around the Croydon area, call us on 07403 452 843 or call for free on 0800 020 9661 to arrange a free quotation. Alternatively you can visit our enquiry page to send an email directly to us. We are proud members of the Federation Of Master Builders (FMB). Click the logo above to view our profile. 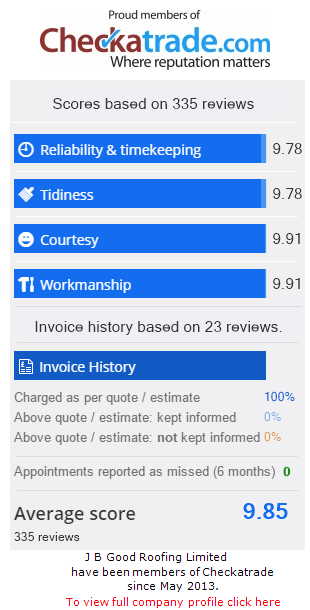 We have a Checkatrade profile where we add photos and also our customers leave feedback based on our recent work. Feel free to visit our page by clicking on the Checkatrade Logo. Replace flat roof on bay window.